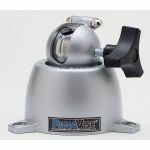 The patented single load control knob and exclusive split-ball feature firmly lock the head into place. This base has three 1/4" (6.3mm) countersunk mounting holes on a 4 5/16" (109.5mm) bolt circle for attaching directly to a work bench or to a portable Base Mount. Accepts all 5/8" (15.9mm) stems.